Scientists have developed a faster and less expensive way to create camelid antibodies that can be used to study proteins and design new drugs. 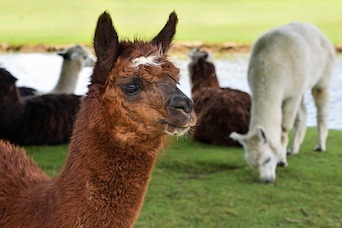 Members of the camelid family—llamas, alpacas, camels—make a unique class of antibodies that allow scientists to determine the structures of otherwise impossible-to-study proteins in the body, understand how those proteins malfunction in disease, and design new drugs that act on them. Utilizing the antibodies, however, doesn’t always prove simple. Currently, a scientist who wants to study a difficult membrane protein using the antibodies has to complete a number of steps. First, he or she must laboriously generate several milligrams of the protein, inoculate a llama, and hope the animal’s immune system responds accordingly. Only then can the search for antibodies in a blood sample begin. The process is made even more challenging by the fact that scientists may not always have access to a llama or camel and, although no animals are harmed in the process, vaccinating them to generate the desired antibodies is expensive, takes as long as 6 months per attempt, and often fails. Although not always profitable, the method is believed to be worth the effort and risk because the active segments of camelid antibodies—often called nanobodies because they can be much smaller than regular antibodies—have been vital in biomedical science. The nanobodies have provided scientists with unmatched insight, including the ability to see how neurotransmitters such as adrenaline and opioids bind to receptors in the brain. Now, for the first time, scientists have devised a faster, less expensive, and more reliable way to create the antibodies: vials of specially engineered yeast that include at least 1 of each unique antibody. Using the engineered yeast, a scientist can label the protein of interest with a fluorescent molecule and add it to the test tube. Yeast with surface nanobodies that recognize the protein will glow. The researcher can then use fluorescence-activated cell sorting to separate the glowing yeast from the rest. The need to inject a camelid is eliminated. For their part, Drs. Kruse and Manglik’s research team tested its yeast system on 2 proteins: the beta-2 adrenergic receptor, linked to asthma, and the adenosine receptor, which is a gateway for caffeine to deliver its jolt of energy. In both instances, the nanobody bound to the desired receptor and only to that receptor. Perhaps best of all, the research team has created a library of 500 million camelid antibodies in frozen test tubes and are offering them free of charge to nonprofit labs. Commercial companies can license the yeast. As needed, the test tubes—each of which represents a miniature llama immune system—can be defrosted, injected with the desired fluorescent protein, and studied. “People who have struggled to nail down their protein structures for years with llamas are getting them now,” Dr. Kruse said.